Do you have ten minutes to spare and would like to learn how to extract DNA or perform a polymerase chain reaction (PCR) in a virtual lab? 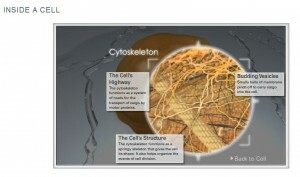 Or maybe explore the inside of a cell and learn more about the functions of cellular components? The Genetic Science Learning Center has put together a fantastic interactive website with tons of learning resources, which are not only suitable for budding geneticists but really for everyone who would like to know more about the basics of genetics, molecular biology and cells. I had a lot of fun with this interactive model of a cell. Mouse-controlled crosshairs give you a sneak peek into its inside. 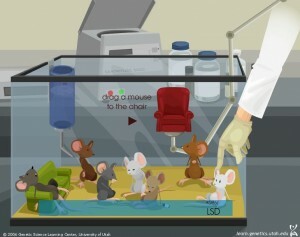 If you would like to know more about a certain cell structure, a single mouse click opens a little animation which is accompanied by a more detailed audio explanation (it is worth turning on your speakers). I was very pleased that this cell could easily be turned into a plant cell – give it a try and watch how the cell wall comes smashing down to imprison this poor cell provide a sturdy and proper support for this lucky cell. 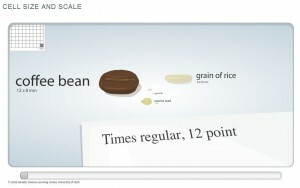 We often get asked about sizes and scales of our microscopy samples and I love this interactive slider “Cell size and scale”, which relates the sizes of bacteria, viruses, skin cells or sperm to every-day objects like coffee beans and Times New Roman regular, 12 pt. 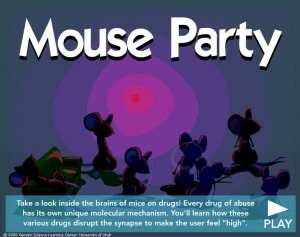 What had me in hysterics however (and is totally not plant-related, but never mind), was the Mouse Party, where you can grab mice with different addictions and lift them into an analysing machine to take a closer look at the processes in their brains making them “high”. Don’t forget to press the “eject mouse” button when you are finished! Visit the fantastic interactive website of the Genetic Science Learning Center, by the University of Utah, but don’t blame me if you spend more time there than you originally planned!